The idea to add a function of mobile contactless payments in a smartphone incarnated company «Huawei» supported by Turkcell and MasterCard. 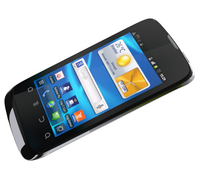 The device T20 Turkcell became the world’s first smartphone based Android operating system, supporting technology NFC (Near Field Communication), by which two digital devices are located at a distance of 10 cm from each other can exchange small amounts of data over a wireless connection. The NFC technology allows you to use your smartphone T20 as a credit card. Оwner of the phone, which support the technology NFC, will be enough to make a payment device to the terminal to pay. In addition, the T20 can be used for digital advertising, transfer contact details as a private company employee ID, electronic ticket.